We have had unbelievably mild temperatures compared to the past few years and this has made it a great summer to be on the water doing your favorite thing. 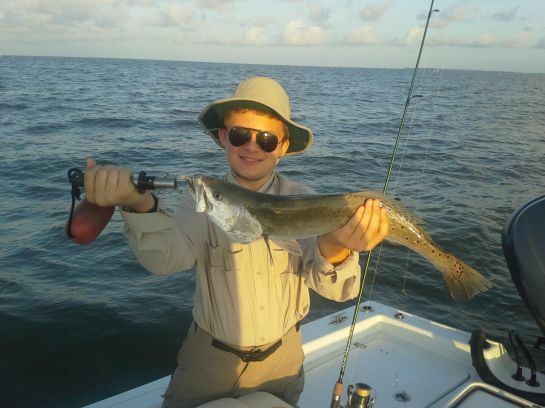 The top-water bite for speckled trout continues to be good. There is just something about hearing that top-water get thrashed on by a hungry gamefish that just gets me pumped up and I love it! When the wind dies down is when that top-water bite really turns on. Walking the dog quickly back to the boat without hesitations seems to be the best retrieve. Having the patience to set the hook only when you feel the fish pull on your rod is the key to successful hook ups or missed fish. 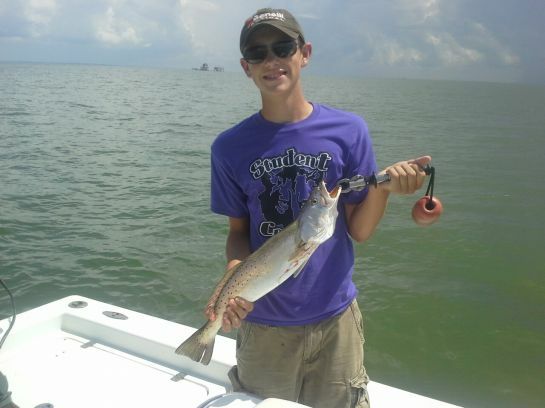 That is a really nice speckled trout young man!! The croaker bite has continued to be the best bite. Especially in less than perfect weather/water conditions. But this constant change in wind/weather patterns has caused fishing to be good one day and bad the next without any real consistent pattern taking hold. I am ready for shrimp season again which typically happens about September 1st but everything is a few weeks behind right now so it could be mid September before that live shrimp bite is back again in full force. I will catch it just wont touch it!! The tourist season is almost over with the return of the kids back to school. I have had a ton of families with young ones these past 2 months and it has been great watching our future anglers having a blast. It is very important to try and teach or expose all kids to outdoor activities like fishing and hunting and how to respect the outdoors and our outdoor resources. 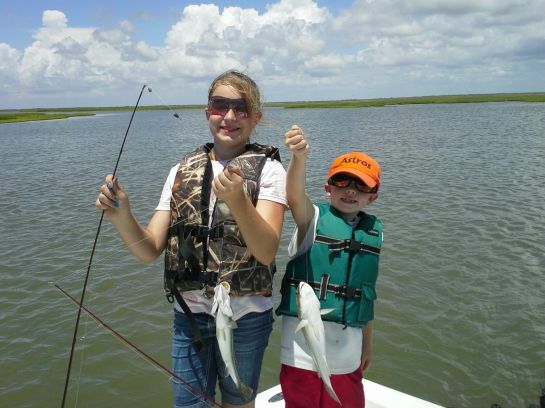 Teaching them conservation early in life gives them the education to be responsible anglers in the future. Redfish have been kind of absent lately. Every few days or so a big school will come thru and slam our lines with hard pulling bronze backs while we are trout fishing and it is typically a chinese firedrill once you get a few bruiser reds running around breaking off lines and looking for props to rub on. But this is what makes it so much fun!! 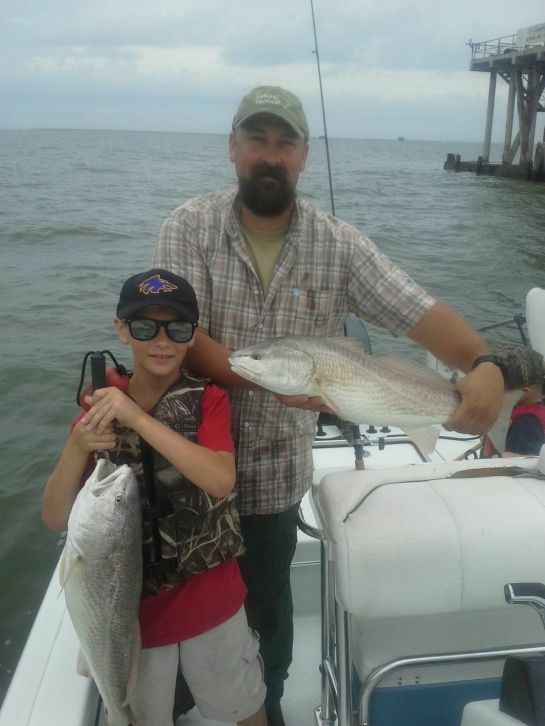 Soon the oversized redfish will begin their annual spawn and start infiltrating our bay system heavily. 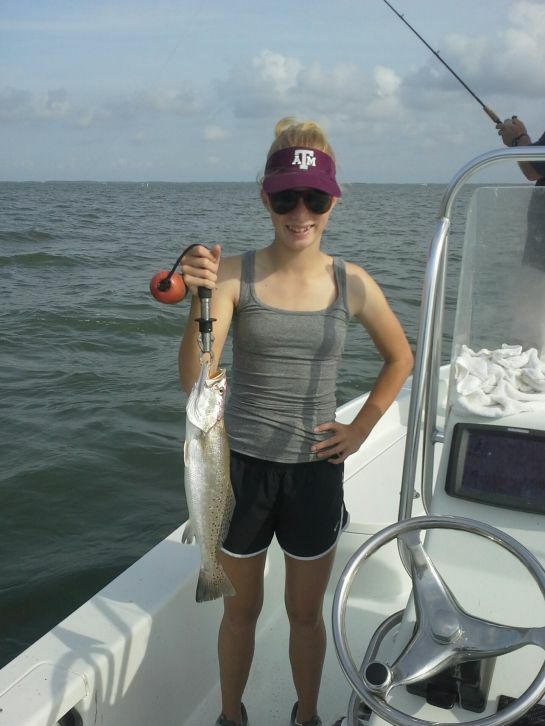 The schools will break up and the redfish will seem to be all over the bays in October. Everybody seems to be spaced out well along the ship channel, East bay and Trinity bay. East bay has been a ghost town this past week or 2 with this Southwest wind blowing. I am seeing only a few boats at most even on the weekends. 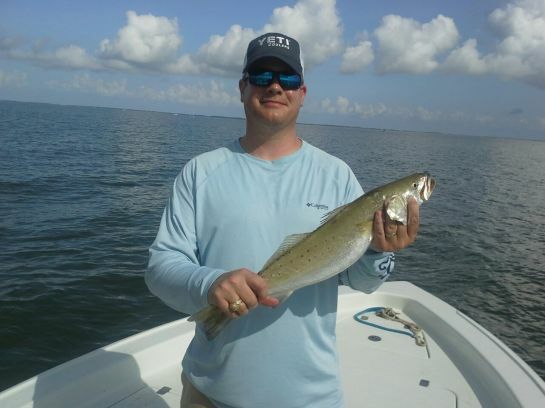 Water clarity has been poor in the mornings and clearing about noon. The fish continue to be all over the marked reefs and they definitely prefer croakers over live shrimp. When the wind is down artificials like plastics or topwaters are working just fine. Colors do not seem to matter much once you find a good feeding school but I have been throwing typically light colors on 1/4 oz jigheads. The Houston ship channel is still holding a lot of fish and will continue to do so for a few more weeks. They have been moving around quite often by being in a spot one day and not around the next day. So moving around is key. Slicks are a major factor in finding good schools along the spoils. Typically I am looking for several sets of slicks but 1 small freshly popped up slick will do just fine. Watch out for the dreaded gafftop. They are all over the channel in good numbers and will eat a croaker very quickly and aggressively. Your younger brother still thinks his is bigger! Fall is coming soon and with it brings some of the best fishing of the year. As the days grow shorter the bite inevitably gets better and better. And we also have a lot less anglers on the water. Less anglers, cooler weather, hungrier fish!!! It is all just around the corner just a few months away!